Update: Completion of both canopies was slightly delayed and could not be achieved by the end of 2016 – the site remains closed to visitors as of yet; as soon as an official new opening date is announced, it will be made public here as well. 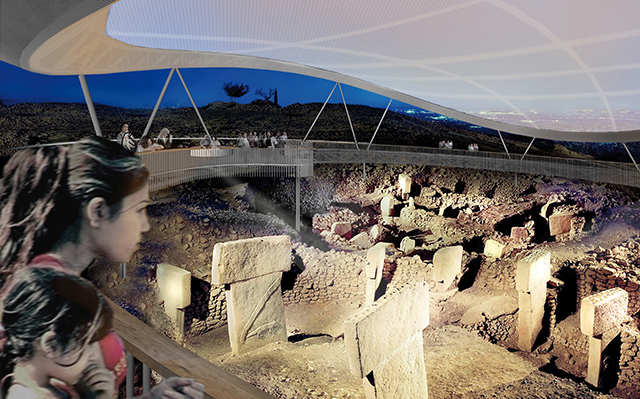 Long in planning, construction of two permanent shelters above the excavated areas at Göbekli Tepe’s south-eastern and north-western depressions are finally about to start as the Turkish Ministry of Culture and Tourism was announcing [external link]. These roofs will not only significantly contribute to the protection of the archaeological substance, but also make accessibility for visitors easier, providing an increased experience of the early Neolithic architecture. For us archaeologists working on site it also opens up improved conditions to carefully excavate rather sensitive features independent of changing weather conditions. Design of the membrane canopy in so-called Main Excavation Area (Visualisation: kleyer.koblitz.letzel.freivogel). Underneath the membrane canopy above Enclosure D (Visualisation: kleyer.koblitz.letzel.freivogel). As just announced, the site would be closed for visitors between June 13 and December 31 of this year (i.e. 2016). Şanlıurfa’s Haleplibahçe Museum [external link] however, will still be open welcoming visitors during this period. 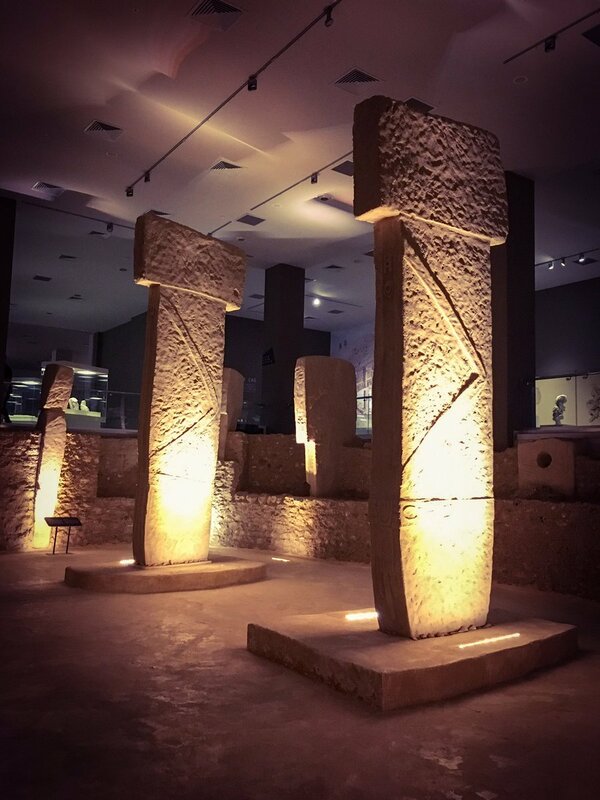 It houses a larger number of finds from Göbekli Tepe and other Pre-Pottery Neolithic sites of the region and even offers the chance to enter a 1:1 replica of Göbekli Tepe’s Enclosure D, the so far largest and best preserved of the monumental enclosure to characteristic for the site. An accessible 1:1 replica of Enclosure D can be visited in Urfa’s archaeological museum (Photo: J. Notroff). Shelters were designed by EiSat GmbH, Berlin [external link] and kleyer.kobltz.letzel.freivogel Architekten [external link]. The contracting authority is the Turkish Ministry of Science, Industry and Technology. The project is financed by the European Union. 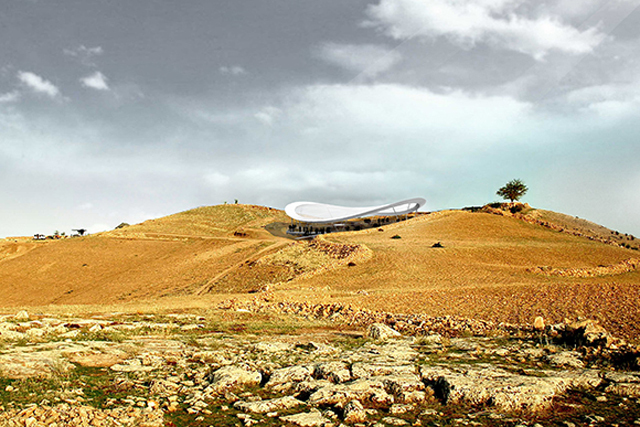 “Membran-Schutzdach für Göbekli Tepe, Türkei” [external link] – project description by EiSat GmbH for the first shelter. “Schutzdach 2 für die Ausgrabungen am Göbekli Tepe, Türkei” [external link] – project description by EiSat GmbH for the second shelter. L. Clare, O. Dietrich, J. Notroff, Die Arbeiten der Jahre 2014 (Herbst) und 2015 [external link], e-Forschungsberichte des Deutschen Archäologischen Instituts 3/2015, 149-151. Could we really call it a ‘temple’? I tried to find Gobeklitepe in Google Earth. It took me to what appears to be a stone quarry with o sign of anything resembling archeological activity or the enclosures. Could someone give me the coordinates for this site? Thank you very much. This location makes far more sense than the quarry pointed to by Google Earth. However, the landscape 11,000 years ago must have been much different to sustain even a small group of hunter-gatherers. There doesn’t appear to be much vegetation to support more than small herds of grazers. This site is a very interesting enigma.